An idealized market environment in which every market participant is too small to affect the market price by acting on its own. Fig. 140 Perfect competition. See entry. (a) Short-run equilibrium. (b)Long-run equilibrium. perfect knowledge of the market by buyers and sellers. In a perfectly competitive market, individual sellers have no control over the price at which they sell, the price being determined by aggregate market demand and supply conditions. Each firm produces such a small fraction of total industry output that an increase or decrease in its own output will have no perceptible influence upon total supply and, hence, price. Further, given the infinite cross ELASTICITY OF DEMAND between the homogeneous outputs of the competing sellers, no seller can increase his price above the ruling market price without losing all his custom. Thus, the demand curve facing the firm will be a horizontal straight line at the ruling market price. In consequence, marginal revenue (MR) equals average revenue (AR). The competitive firm is a price taker, accepting price as something completely outside its control, and will simply adjust its output independently to the most profitable level at that price; that is, the firm will continue to produce additional units of output so long as price (= MR = AR) exceeds marginal cost. When these are equated, the firm will maximize profits. Fig. 140 (a) shows the short-run competitive-equilibrium position for a ‘representative’ firm and the industry. 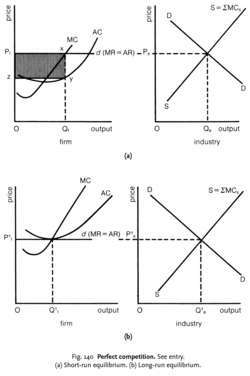 The individual supply schedules (MCs) of x’ number of identical firms are summed horizontally to obtain the industry supply curve (SS). Given industry demand (DD), the short-run equilibrium price and output are Pe and Qe. Taking the equilibrium price as given, the competitive firm establishes its profit-maximizing output at the level Qf (P = MC) and, in this case, realizes ABOVE-NORMAL PROFITS (Pfxyz). The long-run equilibrium position can also be ascertained. It is deduced, from the assumptions of profit maximization, perfect knowledge and free entry and exit, that, unless the returns to the productive resources employed in the industry are at a level that could be derived from alternative uses elsewhere in the economy, there will be resources entering or leaving this industry. In general, outputs will be adjusted to demand until market output is extended (or reduced) and price reduced (or increased) to the point where the average cost of supplying that output is just equal to the price at which that output sells. If, as in the example above, established sellers are earning above-normal profits, then new resources will be attracted into the industry, thereby increasing total market supply and reducing market price. This process will continue until the excess profits have been competed away. Fig. 140 shows the long-run competitive equilibrium position for the ‘representative’ firm and the industry. Given an unchanged industry demand (DD), the long-run equilibrium price and output for the industry are P1e and Q1e. Given the equilibrium price, the firm establishes its profit-maximizing output at the point Q1f, where P = MC at the point of minimum long-run average cost. Static market theory shows perfect competition to result in a more efficient MARKET PERFORMANCE than other forms of market organization (see especially the comparison with MONOPOLY). Specifically, market output is optimized at a level equal to minimum supply costs; consumers are charged a price just equal to minimum supply costs, with suppliers receiving a NORMAL PROFIT return. The conclusion of competitive optimality, however, rests on a number of assumptions, some of which are highly questionable, in particular the assumption that cost structures are identical for small perfectly competitive firms and large oligopolistic and monopoly suppliers (see OLIGOPOLY, ECONOMIES OF SCALE), while, given its static framework, it ignores important dynamic influences, such as TECHNOLOGICAL PROGRESS. See also MONOPOLISTIC COMPETITION. Other papers have argued that innovation can be sustained in a perfectly competitive economy with no monopoly rents. The decision of KZK is supposed to mean that in Bulgaria there is a perfectly competitive fuel market, Nikolov said in a Tuesday interview for BNR. This is because, "if all industries in an economy are perfectly competitive, . Similar to consumer surplus, the total surplus asymptotically approaches the perfectly competitive market values from below as n [right arrow] [infinity]. Under the assumption of a perfectly competitive capital market, competition among potential equity owners will induce an equity cash investment in the bank (the book value of equity) that is equal to the bank's market value of equity, that is, Tobin's Q takes on a value of unity. 2007), "The Impossibility of a Perfectly Competitive Labor Market," Cambridge Journal of Economics 31: 781. Remarkably, economists typically start their classes by heralding the mutual benefits from trade going to trading partners, only to later idealize the perfectly competitive market in which producers receive no net gain from production while consumers who had nothing to do with the product and market development get all the gains. A perfectly competitive market has four characteristics: a homogeneous commodity; perfect, cost-free, and readily available information; productive resources that are sufficiently mobile that pricing decisions readily influence their allocation; and participants whose market share is so small that none can affect the terms on which the commodity is sold, so that each participant takes those terms as given. The essential attribute of a contestable market is that any equilibrium must have zero profit and long-run prices must be equal to marginal costs--this reminds us of the perfectly competitive market. The Russian airline industry: contestable market or ...? Economics teaches us that uncertainty and informational advantages resulting from the division of labor are pervasive facts of markets, except for one market structure in which there is no uncertainty and, more importantly, there is no asymmetric information: the perfectly competitive market model. Perfectly competitive equilibrium is also a Platonic ideal in the sense that it is the only stable outcome--that is, the only outcome for which neither buyers nor sellers have an incentive to change their behavior. Most firms engaged in international trade do not conform closely with the economists' ideal of being perfectly competitive.